New for August 2010! Filling factor is what connects Keffective to ER. 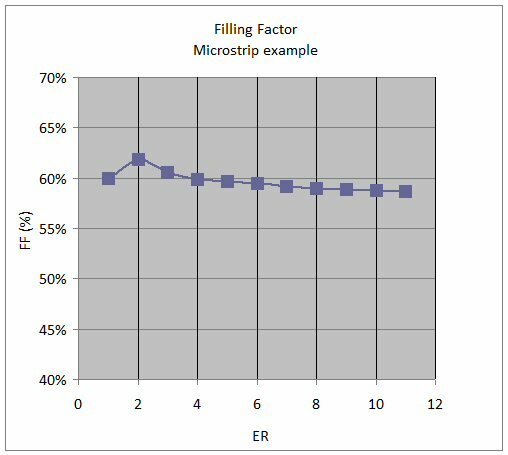 Filling factor is a measure of the percentage of the electric fields in a transmission line that cut through the substrate. In non-TEM transmission lines such as CPW and microstrip, the electric fields cut through two (or sometimes more) dielectric materials. For now, we will only consider the case of two materials, and one of them is air (ER=1). If FF is the percentage of fields in the material, then 1-FF is the percentage of fields in air. 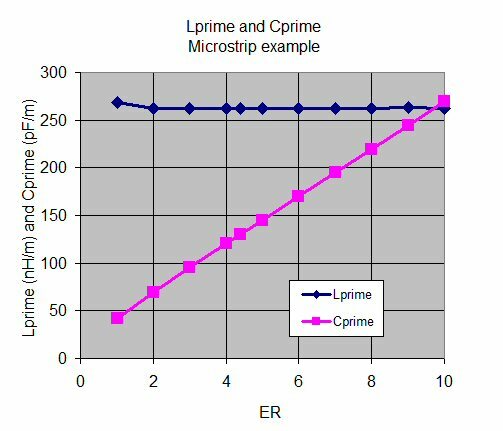 A note about calculating Keff... you could use the Microwaves101 microstrip calculator, and come up with values of filling factor. But we'll let you in on a secret... our microstrip calculator is not as accurate as ADS, because we used simplified equations that don't take into account thickness of the metal strip. In the case of this geometry, the error is large enough so that we decided to go with the better calculation, indeed, the Microwaves101 Keff value is almost 10% too high. In the future, we'll try to post a calculator with the full microstrip solution, but for now, let's just say beware of free calculators on the web! Now let's calculate the inductance and capacitance per length (L' and C'), and plot them. Guess what? Inductance/length doesn't change much, when you radically change the dielectric ER in a non-TEM transmission line. The capacitance/length changes linearly, as you'd expect. This is a direct result of FF remaining constant versus ER!